Bringing greater involvement and collaboration to United Nations peacekeeping by aligning the technological and innovative capacities of the world with the specific needs of the field missions: Innovation can be transformative. In field technologies in particular—a strategically important area of the United Nations—applying novel approaches to global peace operations can help peacekeepers make faster and more informed decisions, better-protect civilians and uniformed personnel by keeping them connected and improve the readiness of military communications officers prior to their deployment to a peacekeeping environment. 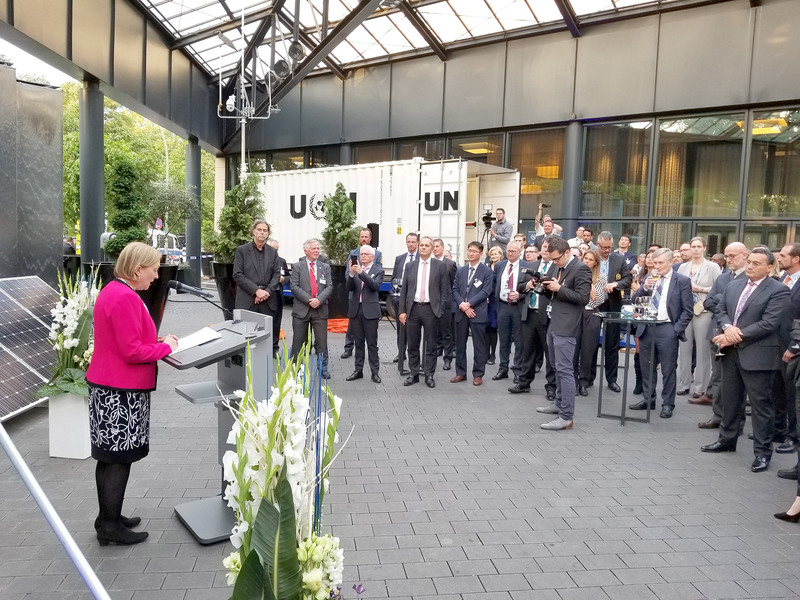 Symposium 2018Lisa M. Buttenheim, Assistant Secretary-General, introduces the technical demonstration of the UN Modular Command Centre to attendees. With technology continuously evolving and expected to play an ever-increasing role in supporting multidimensional mission mandate implementation, DPKO-DFS and Member States are presented with both a challenge and exciting opportunities. The Partnership for Technology in Peacekeeping initiative offers Member States an opportunity for a new kind of relationship with DPKO-DFS beyond the traditional troop, police and financial contributions—one that aligns the technological and innovative capacities of the world with the specific needs of the Field Technology Sections in the field missions. The international symposium is at the core of the initiative, and it is the only information-sharing conference on field technology organized for the peacekeeping community. The conference provides a platform for a high-level technology think tank committed to identifying the strategic challenges in peace operations and initiating innovative partnership projects that have the potential to quickly impact peacekeeping through real and effective solutions. The forum has proven to be fertile ground for knowledge sharing, brainstorming, synchronized efforts, the development of new partnerships, and practical, hands-on projects; an early success and ongoing initiative of the Partnership for Technology in Peacekeeping is the UN Signals Academy. During the event, attendees meet with senior leaders from United Nations peacekeeping missions, the Global Service Centre, and Headquarters to learn about the current state of field technology operations, its future, and the specific areas where opportunities exist for contribution and collaboration. Symposium themes set the tone for high-level discussions. The 2018 symposium attracted a number of attendees from member states with an interest in making a significant impact on the core operations of the peacekeeping missions. Representatives from Member States, academia, think tanks, and other UN partners met with DFS Field Technology teams to identify whether the expertise pools available in Member States could support the ongoing activities in peacekeeping technology. Discussions around innovation built upon the momentum from the prior symposia. Key outcomes from the mid-May event are presently being compiled. The event attracted 118 representatives from the military and police of 18 Member States, and academic and research institutions: Korea Research Institute for Human Settlements (KRIHS), the OSGeo and Politécnica di Milano, Italy, the University of Applied Sciences, and Arts of Southern Switzerland. The conference attracted 100 military and police from over 30 Member States as well as representatives from the United Nations University, the Danish Institute for International Studies, the United Nations Office for Outer Space Affairs, the United States PeaceTech Lab, and the Organization for Security and Co-operation in Europe. This first-time event attracted 46 international delegates and included military and police from 16 Member States and the North Atlantic Treaty Organization (NATO) and officially established a high-level strategic partnership framework to meet annually to discuss projects and in0itiatives that enhance information technology and communications for peacekeeping missions. The symposium has proven to be a very effective and successful platform to achieve actual outcomes that can impact missions almost immediately and to find ways to utilize and redirect existing capacities in a mutually beneficial way. Learn more about ongoing initiatives.